Fan hit by broken bat at Fenway Park suffers life-threatening injuries. 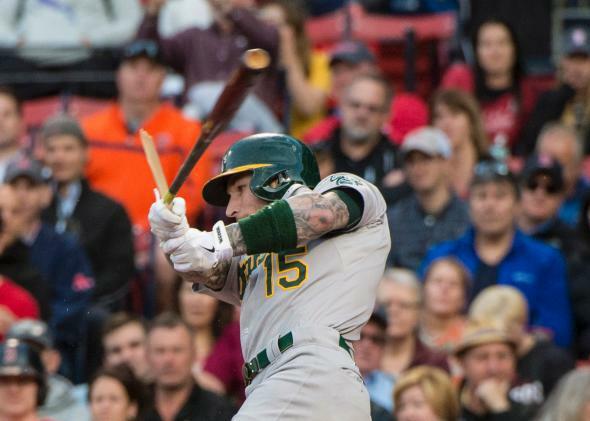 Oakland Athletics third baseman Brett Lawrie (15) breaks his bat during a game against the Boston Red Sox at Fenway Park. The game between the Boston Red Sox and Oakland Athletics on Friday took a harrowing turn in the second inning, when a woman suffered life-threatening injuries after she was hit in the face by a broken bat. It all happened when Oakland Athletics batter Brett Lawrie hit a ball and the bat shattered, leaving only the handle in the player’s hands. The broken bat went straight into the crowd and hit a woman who was sitting with a man and her young son. “Her screams could immediately be heard by fans and even those listening to the game on the radio,” reports the Boston Globe. “Paramedics and police rushed to the seats as the game was stopped and fans covered their mouths and either stared at the commotion, or looked away intentionally.” The woman, whose clothing was largely covered in blood, was then put on a stretcher and rushed to the hospital.